Authority is one of the main aspects on which Google is focussing. And authority comes in different ways. There is the authority of those around you, there is the authorship, which has another big reason for Google: to determine which content belongs where. On top of that Google makes sure you are indeed connected to a Google+ page, which means they are able to much better determine your connections. And then there is the connection with your Google+ Business Page, which also has ‘authority’ which you can make stand out in the search results. 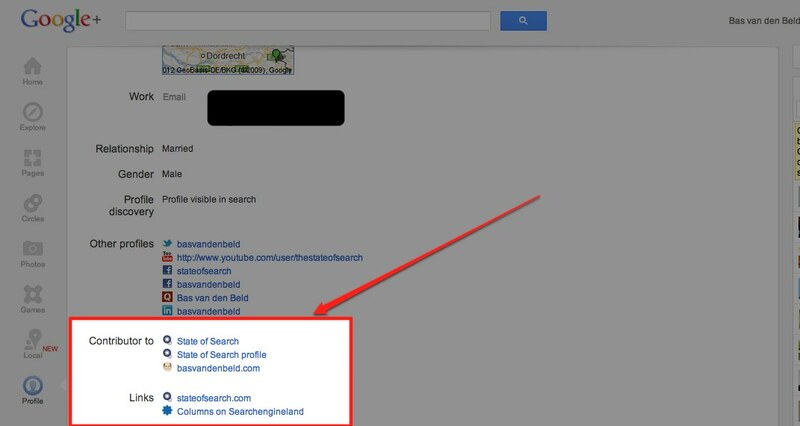 And content you put on your Google+ page also shows up in for example the search results. Until now getting your content connected to your Google+ (business) page and showing your image in the SERPS was quite a difficult process. Especially if you want content which is on your website to be connected to your Google+ page and showing up connected in the search results. But now Google has made things easier by creating an easy method of linking your website to your Google+ page. Note: we are talking about your Google+ Page here, not your personal profile, read more about that below. In a Google+ announcement (a way which slowly seems to be replacing ‘official’ blogs by Google) Googler Dennis Troper said Google is rolling out this improvement right away, making ” the linking process a lot easier for page owners“. Just a few simple steps, combined with adding a short piece of code to your website and you are done. 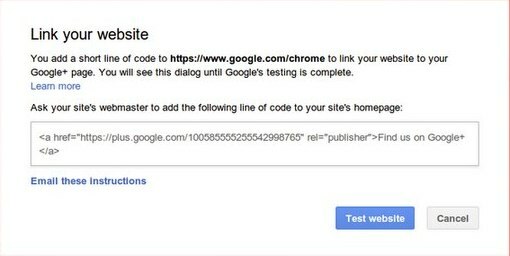 4) Follow the instructions for adding a short line of code to your website’s homepage, then click ‘Test website’, wait for the confirmation. Within a day or two, the link between your website and your Google+ page should be active, and a check icon will appear next to your URL on your profile. The result of this all can be that your latest Google+ posts and your website content will show up on different places, for example in the search results. Now take note that what we are talking about above is your Google+ Business Page, which means we are talking about making the content on your Google+ Page show up in the search results or content from your website connected to your Google+ Page. That is a slightly different thing from making your personal Google+ profile show up as an author next to a post on your website or the website you blog for. The author markups connect the content on your website to your personal Google+ account which means your name and image might just show up next to an article in the Google search results as the author of a post. It makes your content stand out. In some cases this is also already integrated in a CMS or in plugging, like for example Yoast’s WordPress SEO Plugin, which will have this integrated in its newest version. I think Google+ for websites should be separated from personal G+ accounts. Emu Boots sale around 50%, and if you pay for two main couples of uk ugg boot, many surplus treats will probably be offered. When it comes to one of the most styling infant, dress your toddler in uggs. Nevertheless, with super delicate ease and convenience, increased desire, and winter weather season approaching, you are able to still discover some terrific provides. visiting this web site and be updated with the most up-to-date gossip posted here. How do I get my resume to seem bigger than it is? hi i cant open rich snippet testing tool is there any other way i can understand my website is connected to google+ ? i get 43 error for snippet tool what is that ? i cant open rich snippet testing tool is there any other way i can understand my website is connected to google+ ?